More than 25 pediatric medical specialties to support the health of all the children in your family. At District Medical Group Children’s Rehabilitative Services (DMG CRS), you will find a caring, comforting and stimulating environment for not only your child but your whole family. With state-of-the-art technology, advanced treatment practices and top pediatric specialists, we provide award-winning care to Arizona’s youngest patients with special needs. DMG CRS is the only multi-specialty interdisciplinary clinic (MSIC) in Maricopa County and was designed to support coordinated, convenient and high-quality care for children with complex conditions. Housed in a one-story building conveniently located in Central Phoenix, DMG CRS includes more than 85 medical providers across more than 25 pediatric specialties. In addition, social workers and other support services are on-site to help coordinate care for your child and make accessing the services and equipment (like wheelchairs, hearing aids and more) you need as easy as possible. Our special needs clinic offers options for routine assessments, therapy, equipment, and education to children from infants to the age of 21. Our special needs patient therapists see to specific pediatric needs such as wheelchair, feeding, hearing aids, splinting and bracing, seating and mobility, communication, cochlear implants, hearing screenings, special equipment, therapeutic casting, and much more. 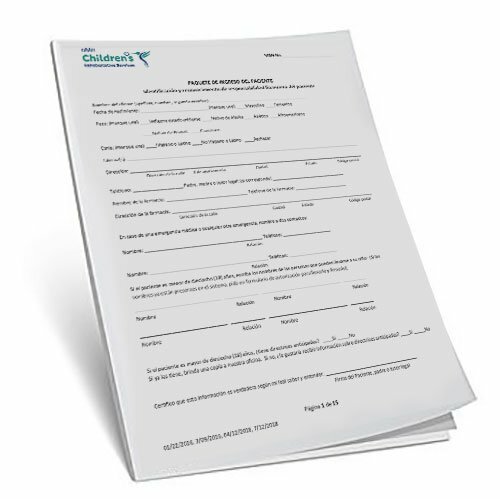 To save you time at your child’s first scheduled appointment at DMG CRS, please download and complete these New Patient forms at home and bring them to your child’s appointment. Forms are available in English and Spanish for your convenience. You can download acrobat reader for free here. You may also call us at (602) 914-1520 with any questions. We are available Monday-Friday, 8am-5pm. You may also call us at (602) 914-1520 with any questions. We are available Monday-Friday, 8am-5pm.